Rev. Elizabeth Hewitt. Glenavy Methodist Church, erected in the 1800’s. Methodism has been in the Glenavy area since the 1700’s. The current building of the church hall and church were erected in the 1800’s. The hall was built in about 1830 and a banner in the church hall refers to a Methodist Sunday School in the village in 1825. The present church was built in 1890 and is situated on the main street in the village. Since its existence, the church has been part of the Antrim Circuit and currently part of Glenavy and Moira Circuit, which also includes Craigmore and Maghaberry. The present minister, the Rev. Elizabeth Hewitt, previously minister of Moira and Megaberry commenced her ministry in Glenavy in July 2007 in succession to the Rev. Leslie Spence (1993-2007) who is now minister of Bluestone and Ballinacor in the Lurgan Circuit. 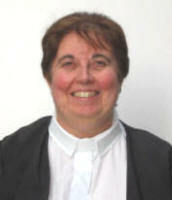 Miss Hewitt now has pastoral oversight of Glenavy, Craigmore, Moira and Maghaberry congregations.